Bittersweet, a gospel stage play written by 15-year-old Aaron Johnson, received an audience’s warm reception in Miami during its debut this month. He and Genji Jacques co-directed the production that was performed before a sold-out crowd in midtown Miami, Florida. 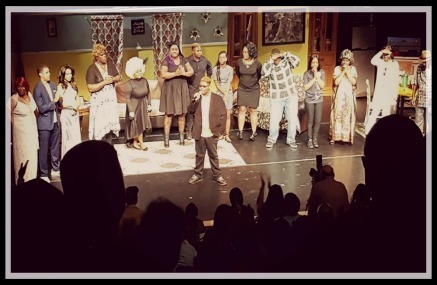 Bittersweet, which was recently staged on September 17 at the Little Haiti Cultural Arts Center in Miami, centers on a family that reunites after years of separation, rallying around their uncle - Deacon Do Right (Arthur Fields) – who is scheduled to undergo surgery. Yet, when the family comes together, all hell breaks loose. Nurturing his passion for writing from the age of 9, it is now Aaron’s mission to restore family togetherness through his stage plays. Akin to the format of urban playwright Tyler Perry, Aaron’s plot in Bittersweet speaks to sundry issues relative to family and its dysfunctions. Themes such as family estrangement, death, love, adultery, drug addiction and heart-rending secrets run through the story, culminating in forgiveness. Hilarious as it was drama-drenched, Bittersweet featured soul-stirring music with solos performed by up and coming vocalists Marcelline “Serenity” Dulorier, Labresha La’che and Dontrell punctuated with the comedy of “Mutha” – a Madea-like character played by local comic Willie Rachel. Original music and songwriting were featured in numbers like “Looking for Love” and “Believe” by Labresha La’che, “Bitter” by Janet Lee and Serenity (written by Dontrell) and “Beautiful” by Dontrell. While everyone did a stand-up job at each of their roles, there was one actor who, because of his ingenuity and physical comedy - could not be replaced – Fields, who played both Do Right/Uncle Pervis. Aaron, who is also a pastor's son and an award-winning filmmaker, plans to stage another production of Bittersweet in December in Hollywood, Florida.